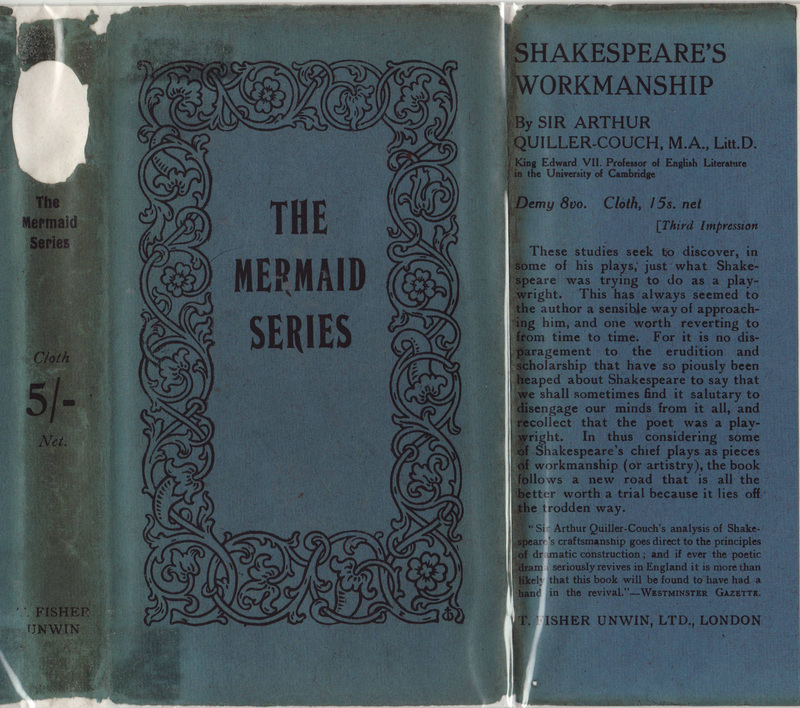 The Mermaid Series was an influential series which reprinted English Elizabethan, Jacobean and Restoration drama long out of print and off the stage. 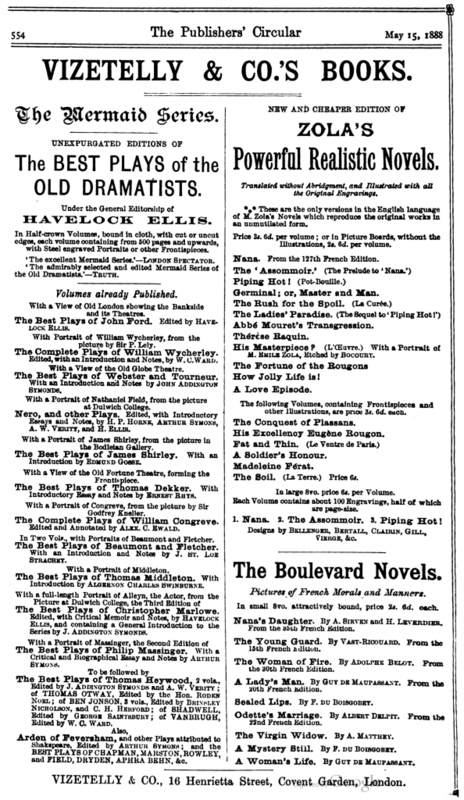 Twenty-one dramatists were featured in the series in one, two and three volume collections, 27 books in all (see below for complete list). Havelock Ellis began work in the mid-1880s on the Mermaid Series with the goal of getting classics into the hands of a large audience (one of the goals of most reprint series). The focus was on playwrights whose work was not easily accessible but nevertheless, Ellis felt, vital for understanding the development of English drama. Ellis worked with publisher Henry Vizetelly on the series, and enthusiastic, young literary critics were enlisted to write introductions and notes for each volume. Development of the series was disrupted in 1888 when Vizetelly was prosecuted for obscenity in a translated version of Zola’ La Terre. Vizetelly eventually published at least 15 of the titles in the series. When Vizetelly’s legal problems prohibited further work on the series, around 1892, the series passed to Unwin who removed Ellis as the series editor and brought out the rest of the series. Scribner was the U.S. publisher. (Lopez, Constructing the Canon of Early Modern Drama, 2014). An advertisement for the Vizetelly volumes of the Mermaid Series appears in the Publishers’ Circular, May 15, 1888. Advertising the volumes as “unexpurgated” was taking advantage of Vizetelly’s problems with the Zola obscenity charges; the hope, it seems, to spur sales with buyers assuming there would be some saucy content in the series. Ellis is noted as the editor of the series, and a few brief reviews are included. 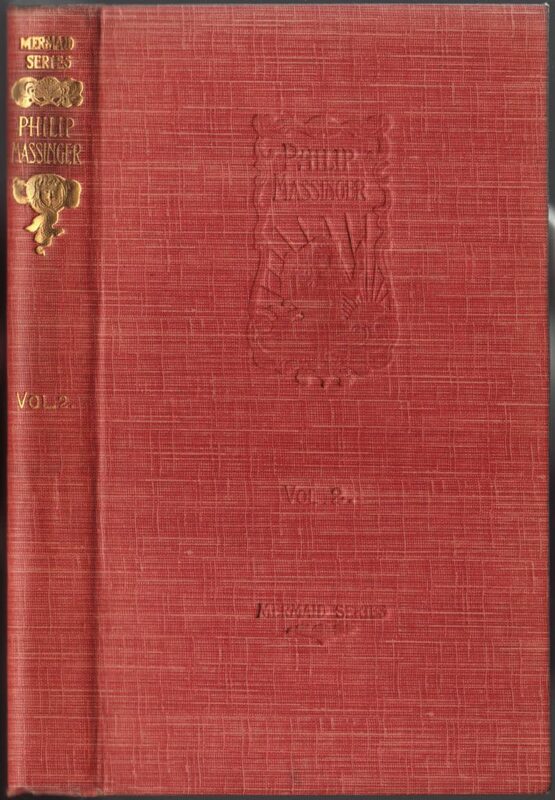 Charles Scribner’s Sons published the Mermaid Series in the U.S. beginning around 1888. 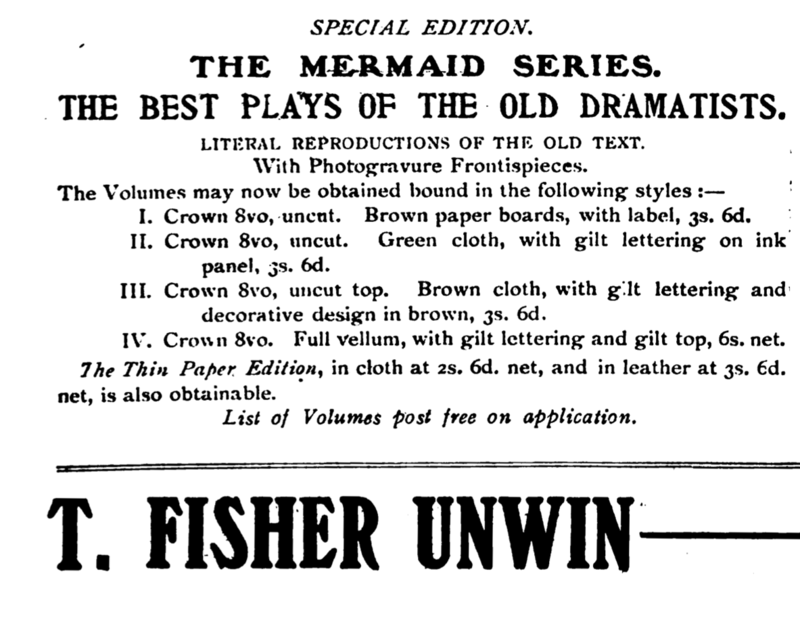 Advertisement for the original Vizetelly editions of the Mermaid Series first issued in 1887. From The Publishers’ Circular and General Record of British and Foreign Literature, Volume 51, 1888. Unwin took over publishing the series, without Ellis as the editor, around 1892 and published the latter titles in the original series. Scribner also issued these Unwin titles in the U.S. In late 1903 both Unwin and Scribner reissued the entire series in a more compact, “thin-paper” edition at a lower cost than the original editions. Initially, in the U.K. at least, Unwin offered the series on a subscription basis. Each book was 5s but you could commit to the entire series for a nearly impossible to resist 2s/6d per month in 13 easy payments. 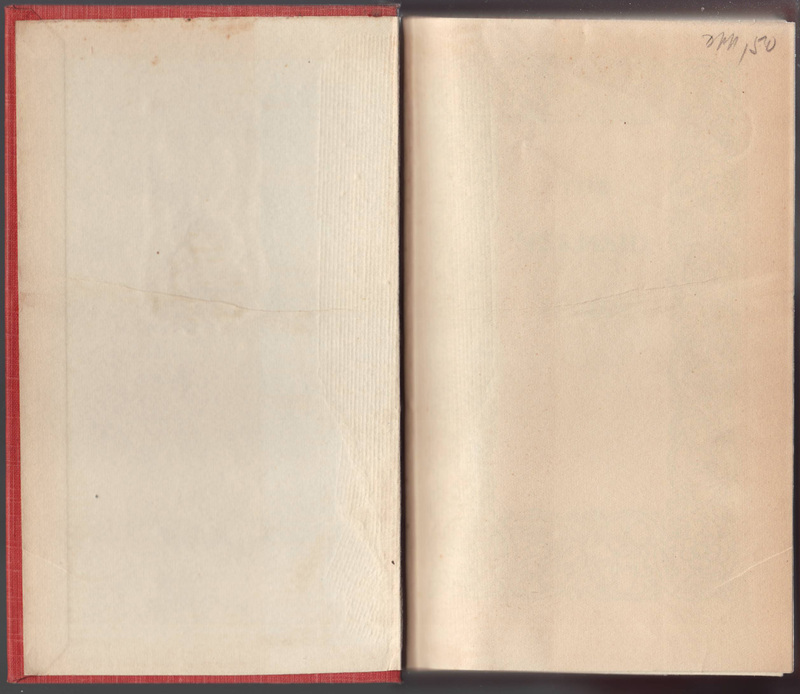 Both cloth and (for a bit more) leather bindings were available on the thin-paper edition. Advertisement for the newly reissued Mermaid Series, The Spectator, vol. 92, 1904. By 1908 one could purchase the cloth-bound thin-paper titles for 2s./6d. a volume, and also, for 3s./6d. the leather-bound thin-paper titles. Several more opulent and larger format bindings of what was most likely the original series (issued by Vizetelly and Unwin) were also available, with the top of the line being a full vellum bound 6s. edition of the series. 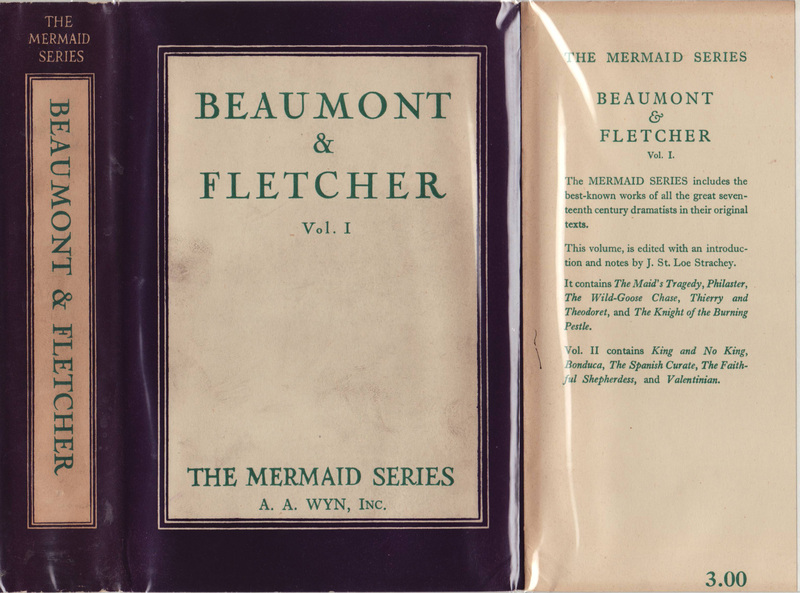 Advertisement for diverse bindings available for the Mermaid Series. From The Publishers’ Circular and Booksellers’ Record, Volume 87, 1908. 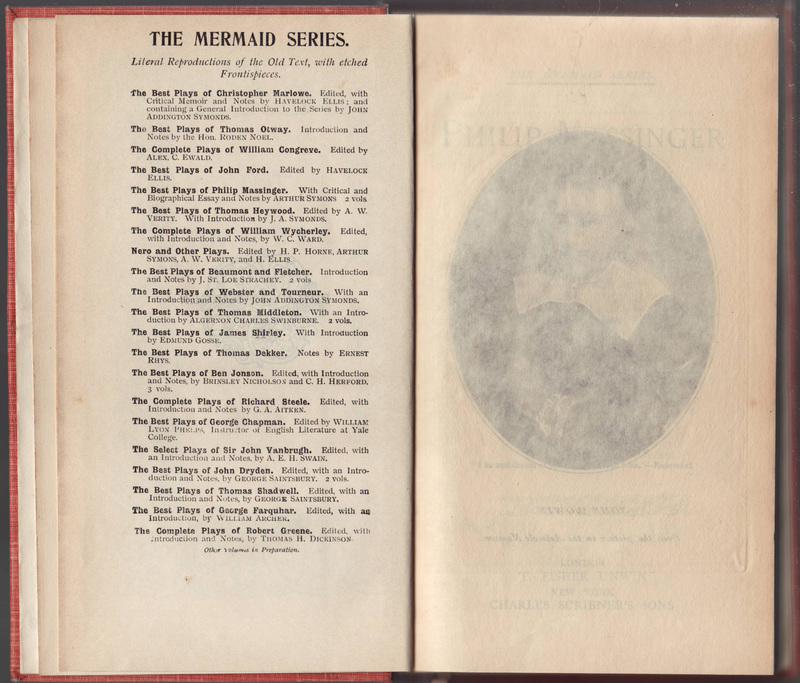 Thin-paper volumes of the Mermaid Series had jackets most likely from their initial publication in 1903. Copies below are on undated books, but given the other titles advertised on the jackets, the books were printed in the 1919-1925 time range. 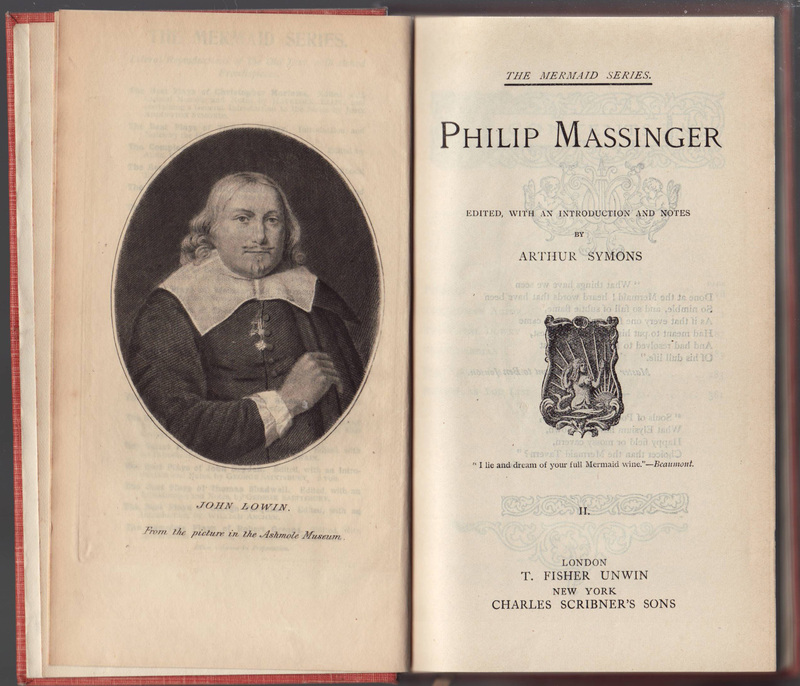 This copy of Volume 2 of Philip Massinger’s Plays was most likely printed around 1919. The dust jackets for the Mermaid Series are generic with no printing on the jacket to indicate the book beneath. Instead, an oval is cut from the jacket spine to reveal the book’s title. Price (5/- net) is indicated on the spine as is the series name. The T. Fisher Unwin imprint is included on the jacket spine. The series name is indicated on the jacket front surrounded by a leafy design. Additional Unwin titles are advertised on the jacket flap. 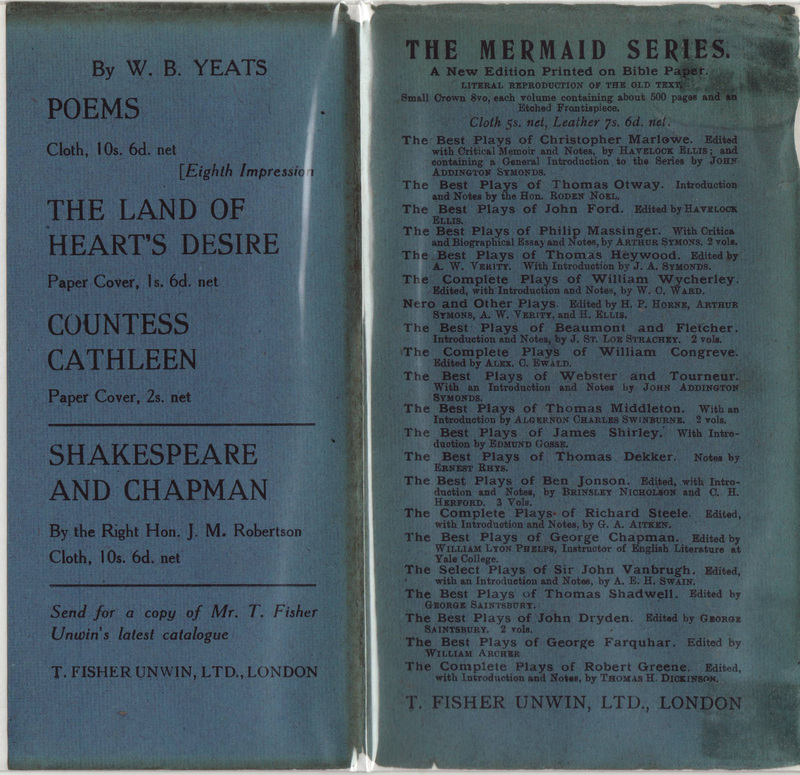 More advertisements, for titles the publisher believed to be of interest to Mermaid Series readers, are on the rear jacket flap. The Mermaid Series titles are listed on the rear of the jacket. Instead of “thin paper” the paper is referred to as “Bible paper.” The price is also indicated. 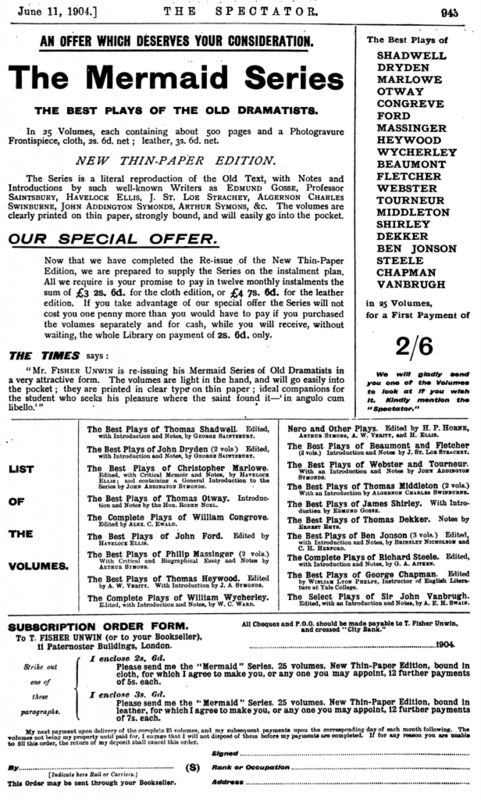 The advertisement above (from 1908) suggests the price had dropped to 2s./6d. The books here were purchased from a Canadian dealer and it’s possible the price remained 5s. in Canada. Or Unwin didn’t update the jackets with the new prices. The leather binding option is also indicated. 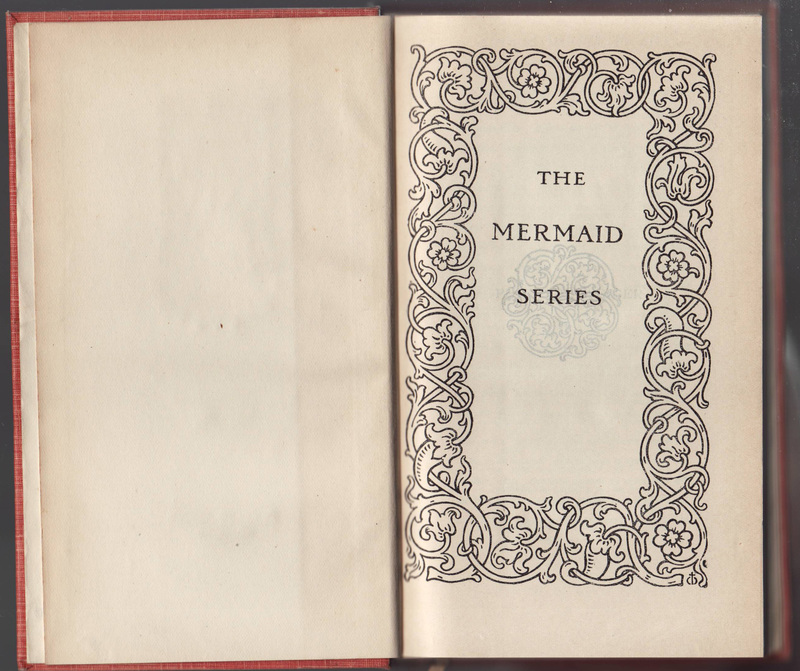 Mermaid Series books from this era are bound in a reddish-orange subtly patterned cloth binding with the series name and author and volume number (if the book was from one of the multiple volume sets). The author’s name is pressed into the front book cover, along with the volume number and series name. 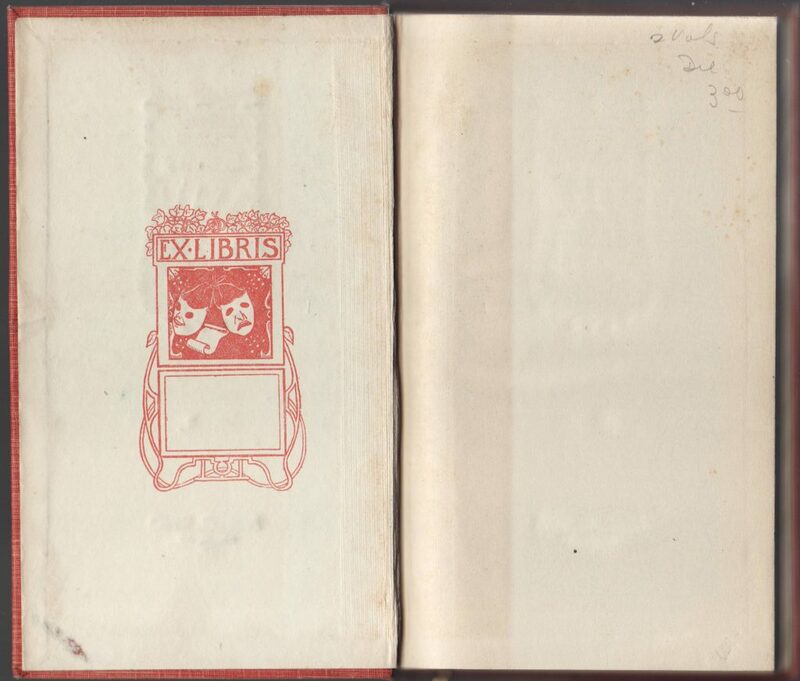 Endpapers include an Ex-Libris printed bookplate. The series name and design, from the front of the jacket, is repeated on the page prior to the half-title page. A list of books in the series follows. 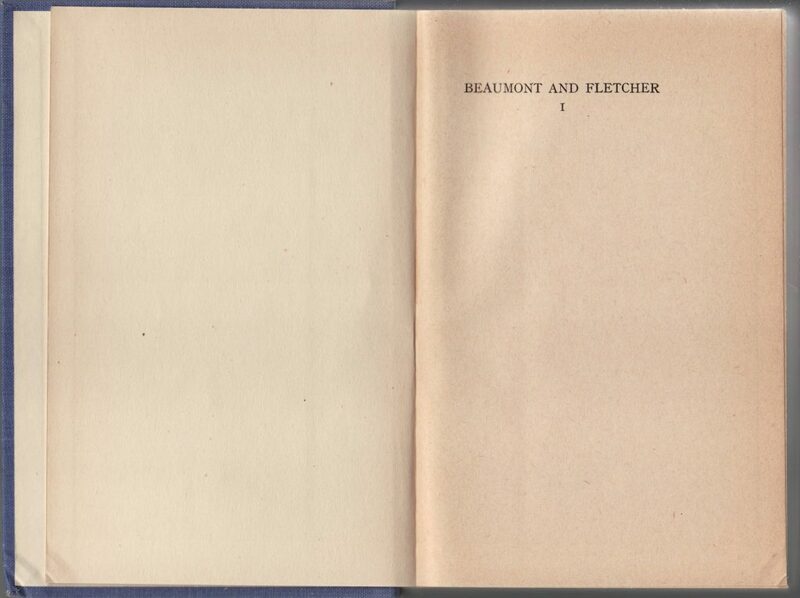 The half-title page is blank. An illustration of the author faces the title page. The series name is indicated along with the editor for the particular title. Both Unwin and Scribner’s are indicated as the publishers. It’s possible that Scribner’s used their own generic jackets. Where one would expect the copyright page is instead a few poetic quotes. No dates are included anywhere in the book. 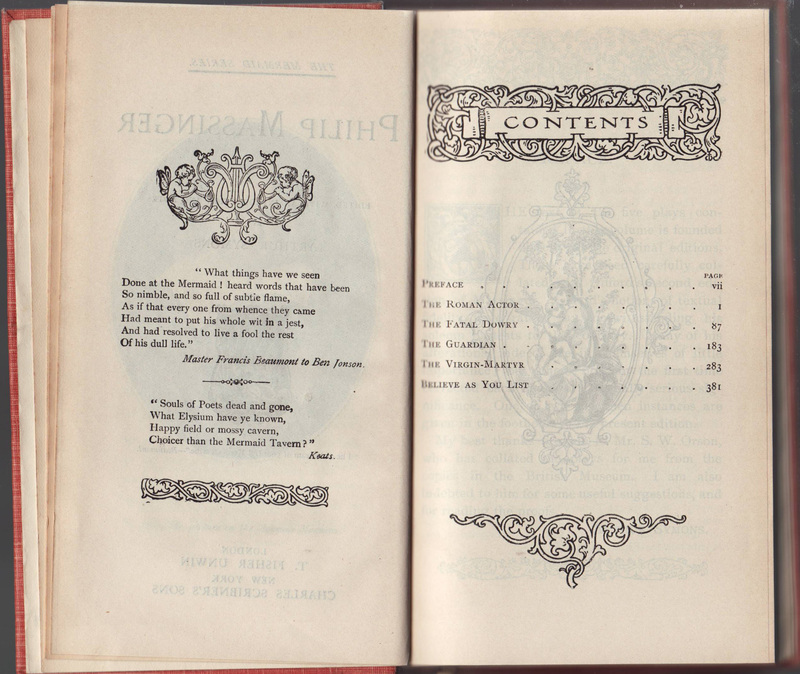 A copy of Volume 2 of Thomas Middleton’s Plays was probably printed in 1922-1923 given the titles advertised on the jacket, which are different from the jacket above. Unwin’s Cabinet Library with 23 titles is listed on the front jacket flap. 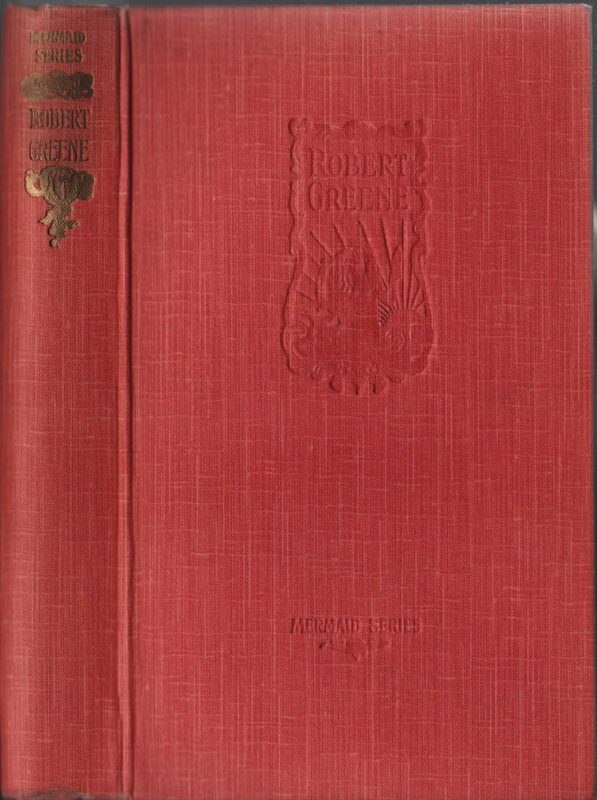 A copy of Robert Greene’s Plays was probably printed in 1923-1924. The Cabinet Library list has expanded to 27 titles. No other advertisements are included on this jacket. Bindings are the same as the earlier (1919) copy. The endpapers are blank, no longer including the printed bookplate. 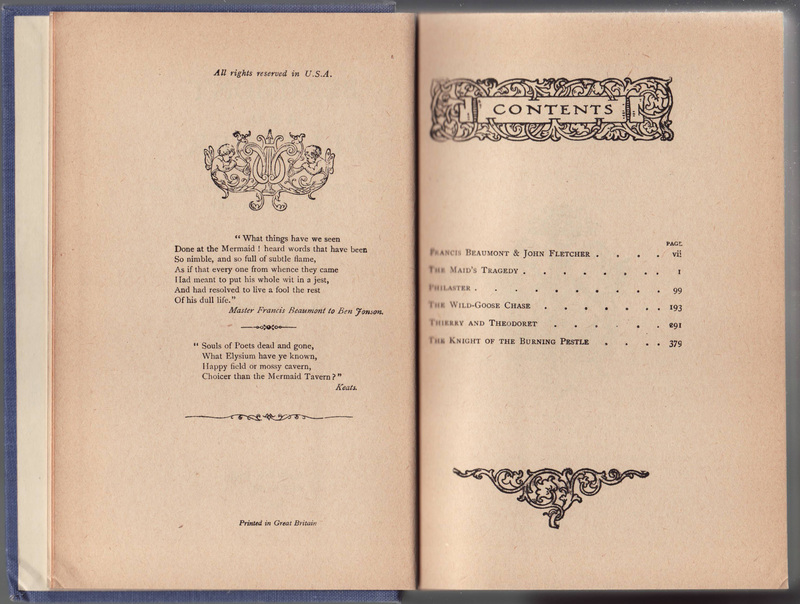 The books remain the same inside as the 1919 edition. Greene’s title includes a woodcut of Greene writing in his death cloak. Or dressed as a banana. When T. Fisher Unwin retired in 1926 his firm merged with Ernest Benn, Ltd. Benn continued to print the Mermaid Series with a different binding (and, it seems, a tissue paper jacket). Benn continued to publish the Mermaid Series in the UK while Scribner’s published the series in the U.S.
New York pulp fiction and comics publisher A.A. Wyn acquired the rights to publish the Mermaid Series in the US from Scribner’s in the 1940s. Wyn was expanding beyond the pulp titles and comics the firm was known for in the 1930s. In 1949-1950 Wyn reprinted the Mermaid Series in a slightly larger format with new jackets. The plates from the pre-WW2 series are used. 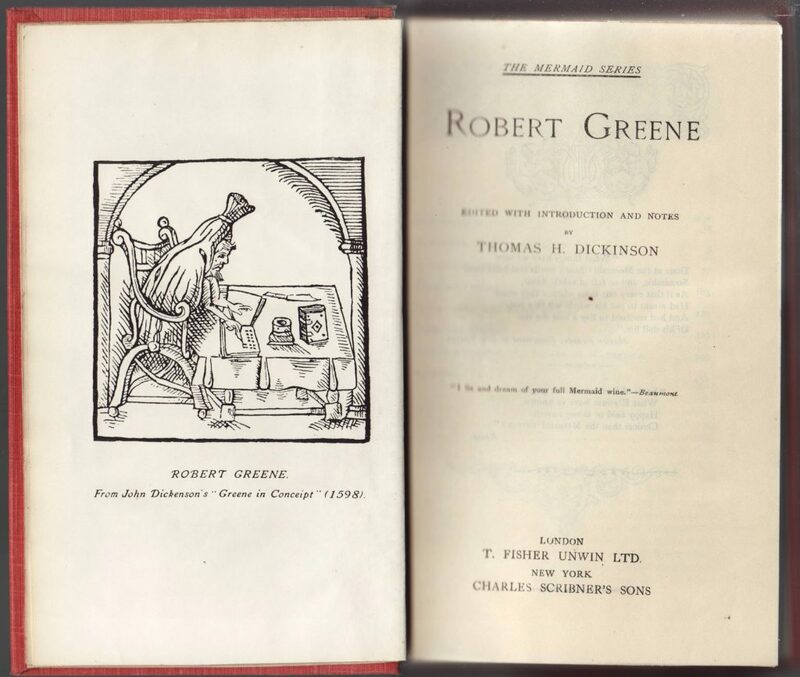 Benn UK dust jackets from this era are similar. A simple common jacket is found on all titles in the Wyn imprint Mermaid Series. The series name is indicated on the spine and front of the jacket. 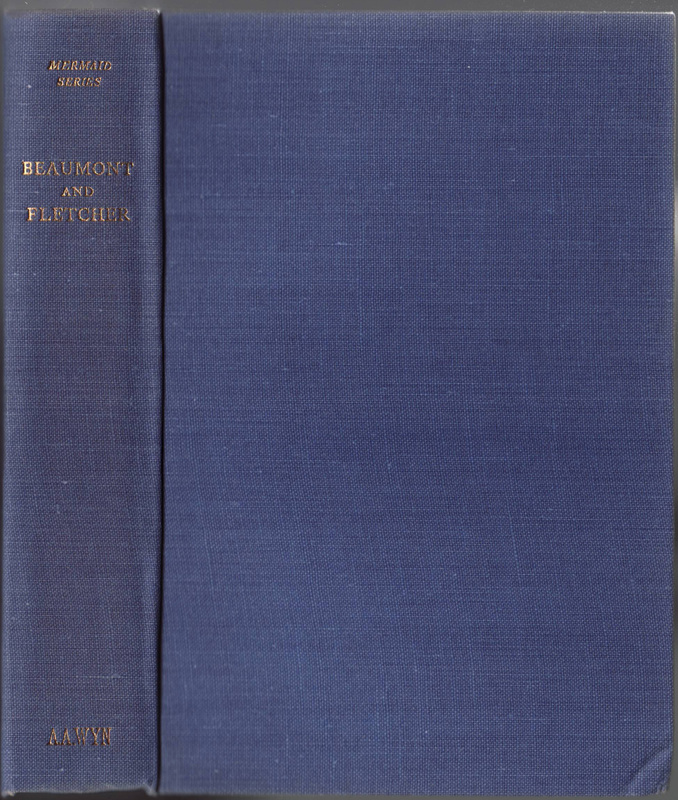 This copy of Beaumont & Fletcher’s Plays (Vol. 1) has a printing date of 1949. Volume 2 has a printing date of 1950. The front jacket flap details the book. The price is $3 per volume. 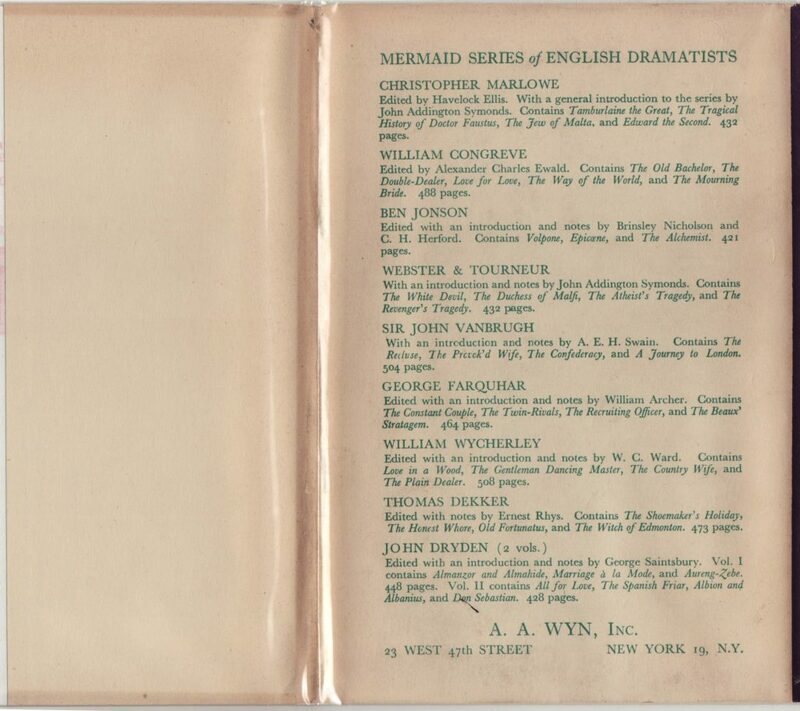 The titles issued in this version of the Mermaid Series are listed on the back of the jacket. Bindings are blue cloth with gold stamping. The series name is at the top of the book’s spine. The copyright page follows the same pattern as earlier editions, with no dates. 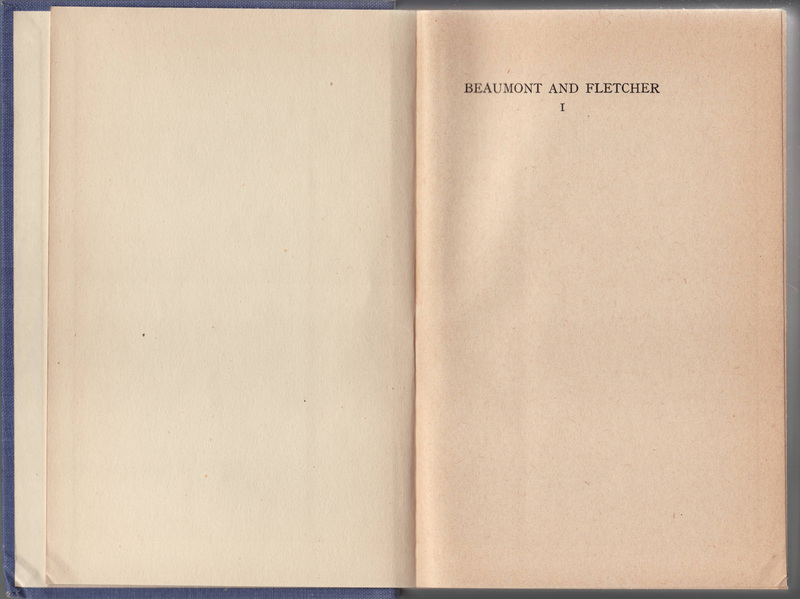 Printed in Great Britain is noted on both Volume 1 and 2 of Beaumont and Fletcher’s Plays. Wyn was probably purchasing printed leaves from Benn and binding and jacketing them in the U.S.